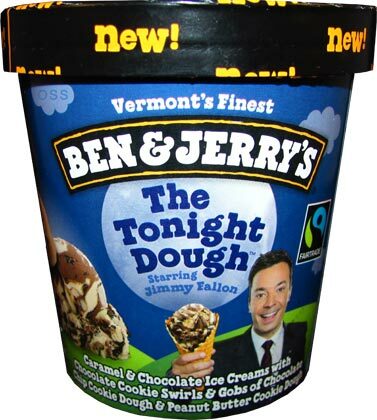 [By Nick, New for Feb 2015] Last night on The Tonight Show, Ben & Jerry's revealed the followup to Jimmy Fallon's Late Night Snack. Well, that's disappointing to say the least. Let's dig down and see if we can get a better look at things. Err, things aren't much better. The chocolate cookie swirls are in full effect but there doesn't seem to be much action from the dough going on. That and look how much of the chocolate base there is. It's easily a 80/20 split if not greater of chocolate to caramel. That's reflected in the taste because I can't taste caramel at all in the pint. The chocolate just dominates it and the caramel was doomed from the start. The chocolate is how it always is bland and boring. There's really not much to say about it I haven't said before. Thankfully there's a bunch of mix-ins to make up for it. 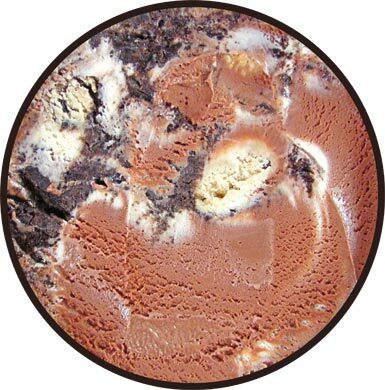 Ben & Jerry's chocolate cookie swirl is one of my favorite swirls of all time. It's essentially a swirl of oreo type cookie wafers and it's delicious. It gives more of a depth to the chocolate base and almost a chocolate cookies and cream feel going on. 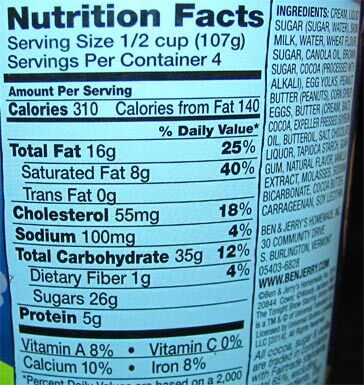 While the cookie dough isn't in high volume, it does make itself known. Well the peanut butter cookie dough does at least. The normal chocolate chip cookie dough just gets downed out by the base. I could feel it's gritty texture but I didn't get any flavor. The combination of the chocolate base and peanut butter cookie dough worked well in PB Half Baked and it's the same here. The peanut butter really shines through and makes that addicting classic combination. Okay, I hope all of that made sense. I made it sound like this ice cream is bad but that's far from the case. It's a good flavor and I'd say it's in my Top 20 from B&J's. The problem is, it had so much potential. They just really failed to deliver when it came to base choice. If they went with a combo of vanilla and peanut butter, I could see this being a hit. As is, it reminds me of Chocolate Therapy with cookie dough thrown in. I'm sorry Jimmy, but you deserve better. Dubba's Thoughts: I was hoping Nick was being overly critical this one, but as is usually the case, I agree that this is an underwhelming ice cream. It's not as unique as Late Night Snack nor is it as epic as Milk & Cookies. Everything just feels lost here. They're trying to do too much in a small space. My biggest disappointment was a lack of my beloved chocolate cookie swirl. Uggg, pick a direction and go with it, no more of this multifaceted nonsense. "Let's just throw everything together and hope for the best" is not how you come up with new flavors. Sorry, now I'm just getting cranky. I agree with you. 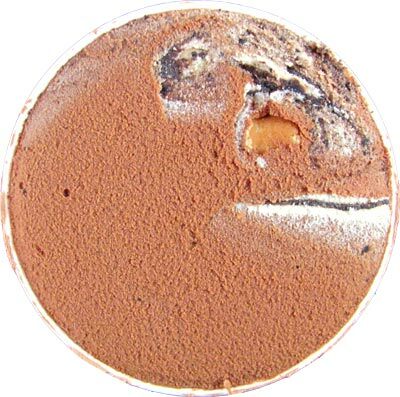 B&J's should have gone with a different base to let the quality of the swirl and cookie doughs shine through, as their chocolate base always seems to overpower the flavor of the mixed-in goodies. A vanilla and peanut butter base would have been better, as you said, but the vanilla bean base that Late Night Snack was used would also have been appropriate considering this is starring Jimmy Fallon. B&J's could have scored way bigger using these suggested bases because an ice cream with those types of mix-ins should be a breakthrough flavor. By the way, you must feel pretty special since you get to sample this before the rest of us! I will say I know most people think Chocolate Therapy is a top 10 flavor from them, so improving that would make it a hell of a flavor. Though obviously this flavor is nothing inventive, which I think most people will have a problem with. Stride, I'm just happy I got to try something before Dubba for once this year. Anon, my list is all time, so discontinued flavors are in it. I'd make the suggestion that we all campaign to get you on the Tonight Show, but I don't think that Jummy Fallon would want to invite you on just to hear about how disappointing his new flavor combination is. They made it look a lot better on their website which is the case with most products I know. What it actually looks like though is really disappointing. I think that would be a great segment for a talk show. I hope college is going well for you Nick. best ice cream i've ever eaten!!! True, I also found the lack of caramel ice cream in my pint to be a let down, but otherwise, this flavor was great. The chocolate ice cream with the cookie swirl reminded me of "peanut butter world", and there were enough cookie dough pieces to tie it all together. I thought it was really good. I do not normally purchase this brand of ice cream but this time it was free so i said what the heck. My husband let me pick the flavor and i went for the one that looked like it had lots of goodies. Well i never thought i would say this but it had too many goodies! It is like cookie dough with a drop of ice cream. I Love sweets but i am not impressed with this at all. In the last two nights i have tried to eatcit but after five or six bites i have to put it away. I don't know if i will ever finish it. I don't know if i would ever purchase Ben & jerry's again but i would certainly not purchase this flavor.